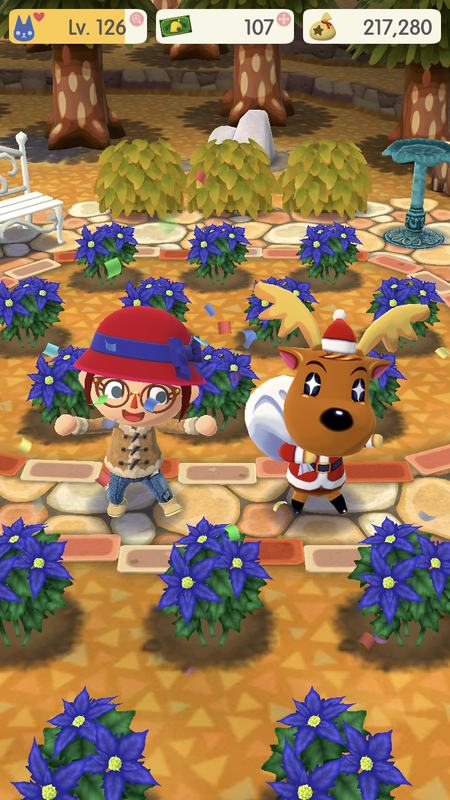 Festive celebrations continue in Animal Crossing: Pocket Camp (Free) this week, following last week’s major update and the beginning of the Toy Day Decor event, which involves completing garden, scavenger hunt, and fishing tourney goals to earn Bell Ornaments to earn three event-exclusive rewards, including a rather merry tree. Last week also introduced Jingle’s Holly Jolly Roundup, Part 1. And now it’s time for the second part of the garden event! The most effective way to complete garden events remains gifting friends with the Elf Hats. Your friends can also gift them to you. The more you do this, the more you’ll collect, so be sure to leave some flowers fully-grown through the event. All flower seeds, flowers, and rewards from the first part of the event remain available. The second part of the event adds Blue Poinsettias, which attract Green and White Jingling Elf Hats. The wallpaper, floor covering, fireplaces, gifts, tables, and trees can be combined to create a most merry environment, especially if you do so in the cozy new cabin that was added in the last update. As the Toy Day Decor goals end on December 26, we know there are more events to come after Jingle’s Holly Jolly Roundup ends on December 10. Except a gyroidite scavenger hunt immediately after the garden event ends, and a fishing tourney following that. Happy gardening!